Emma is five years old and she spent those first five years of her life in a Ukrainian orphanage, spending much of her time in a crib. She was so weak that she could not sit unassisted at five years old. A little over a month ago, Ms. Emma was adopted and was brought to the United States by her adoptive family. Emma has Down syndrome, a major heart defect and severe pulmonary hypertension ... her adoptive family was prepared to have her heart repaired. Soon after being home, Emma thrived. She began sitting unassisted in less than a month and has just done amazing things. Her family scheduled her visit with a cardiologist and Emma had a cath done last week in preparation of her upcoming heart surgery. After doing the cath, Emma's family learned that so much damage has been done that the cardiologist is not recommending surgery because he does not think Emma will survive. This news was a blow they did not expect. They obtained a second opinion and that cardiologist agrees, although seems to be of the mindset that they have nothing to lose by doing surgery, because her lifespan without surgery will be limited. 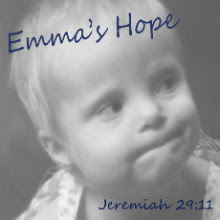 Please pray for Emma Hope and her family during this difficult time as they search for the answer. Click here if you would like to follow their journey.